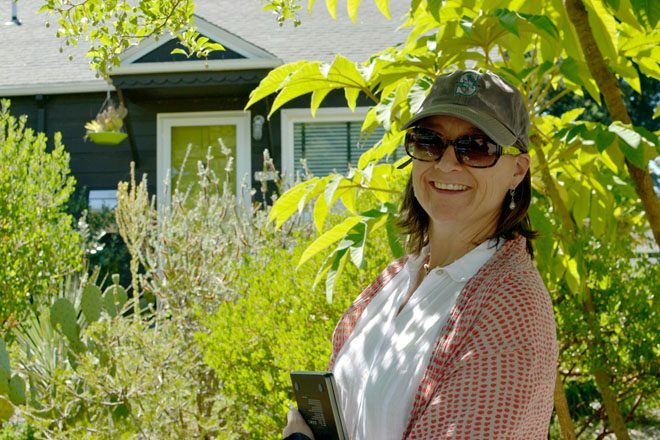 People, and Gardens, and Plants! 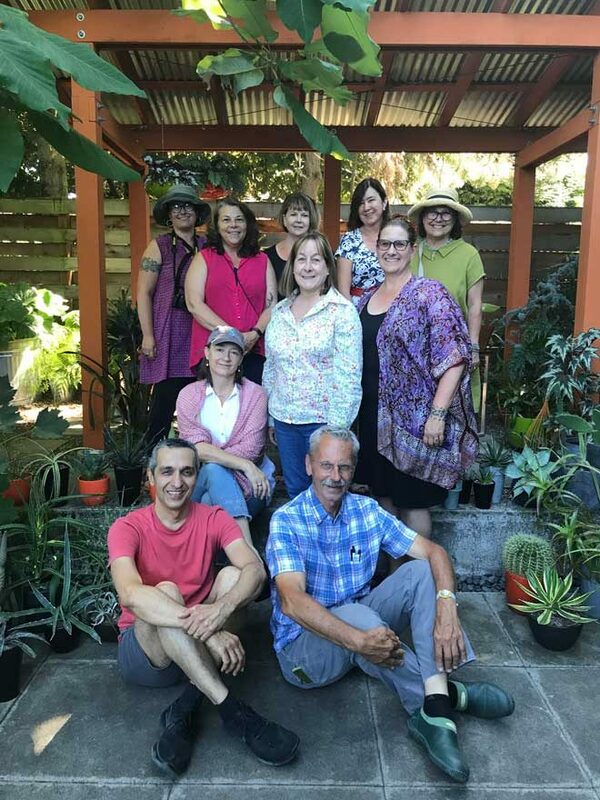 Our “official” group photo was shot in the Danger Garden, a botanical paradise with plenty of sharps created by PHS board member Loree Bohl. 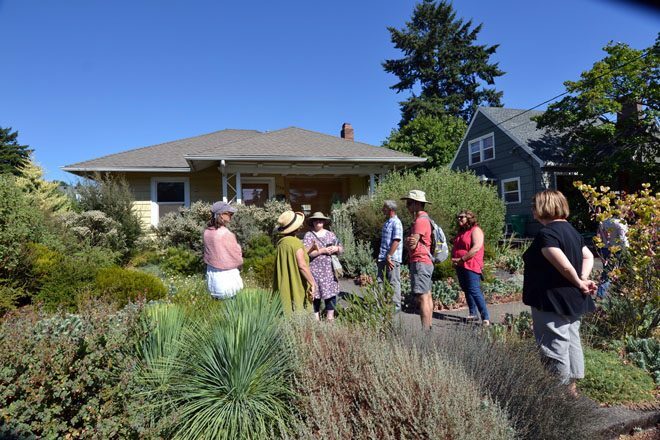 In late July the PHS board of directors and staff gathered in Portland, Oregon, for some creative brainstorming, our official board meeting, and visiting gardens. 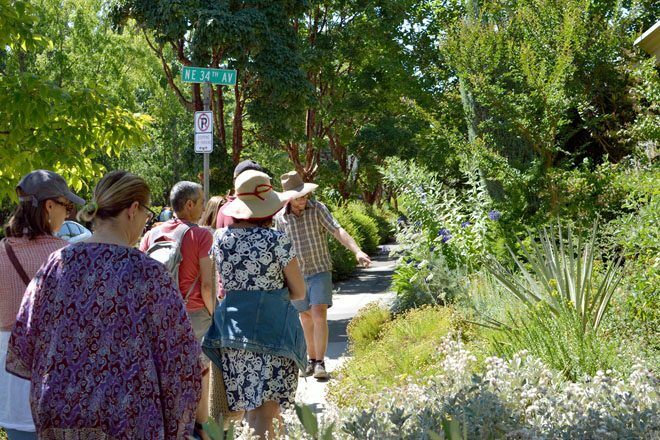 Nothing beats connecting with like-minded people who share our vision for beautiful gardens and a healthy environment. We all came away from our time together energized and focused on the future. Thank you Portland, we had a wonderful time. PHS Board President Jennifer Jewell. 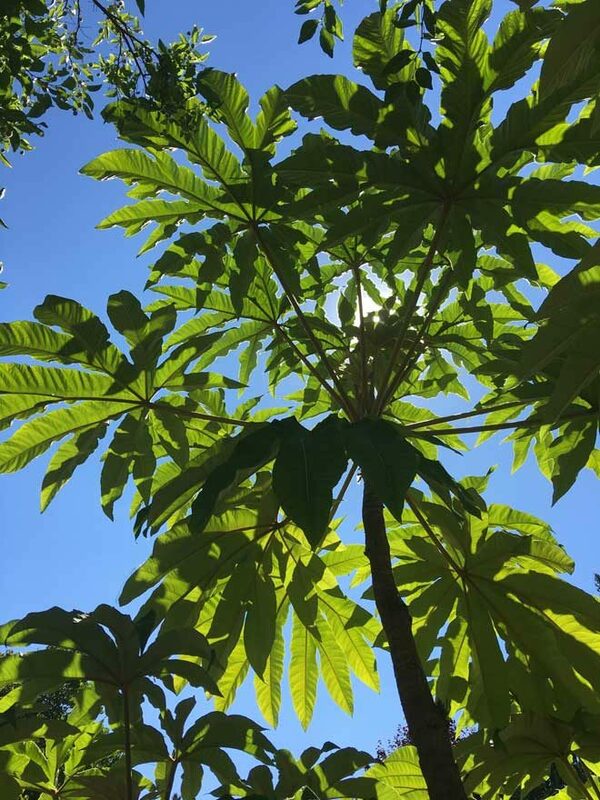 We decided Tetrapanax papyrifer‘Sterodial Giant’ was the totem plant for our weekend in Portland. 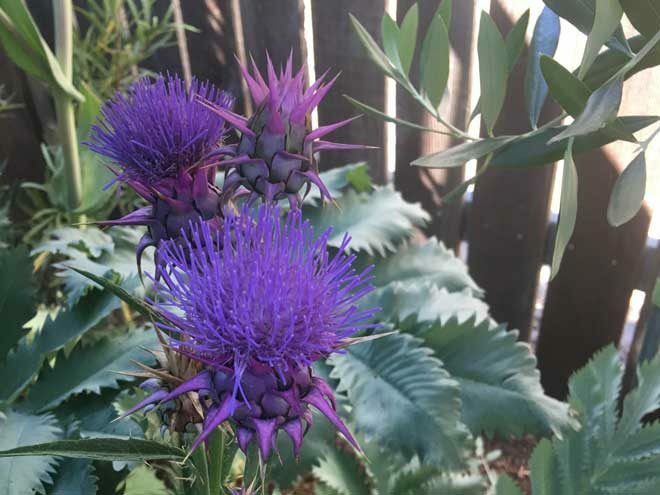 We saw the dramatic plant in several gardens, but this one in Loree’s garden was a real showstopper. 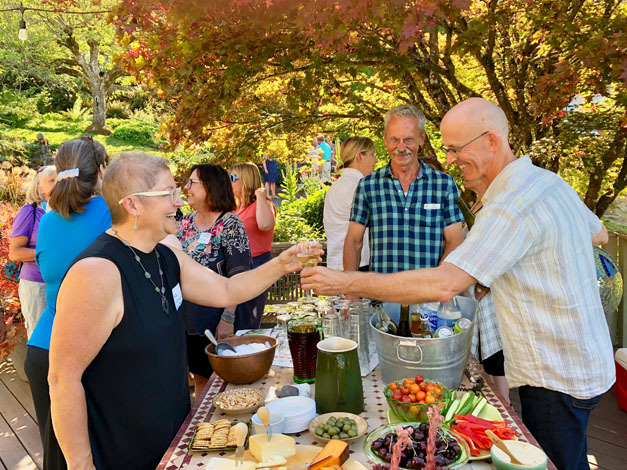 Our garden touring began at McMenamins Kennedy School, a hospitality enterprise known for its commitment to creating dazzling landscapes at several of their properties. 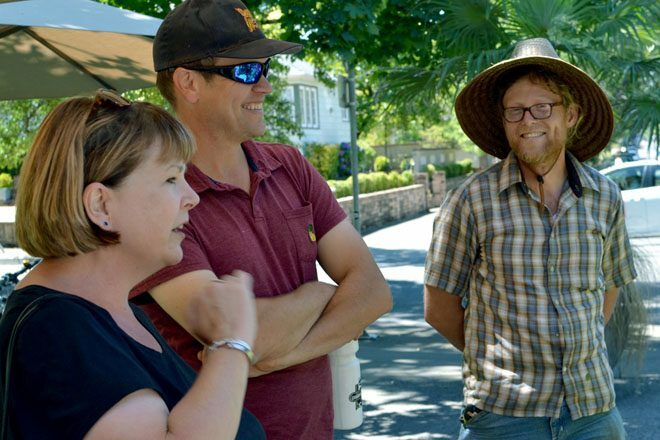 Loree Bohl (left) arranged for us to meet and chat with Erich Petschke, Corporate Gardens Manager for McMenamins (center) and Ryan Miller, Lead Horticulturist for the Kennedy School (right). 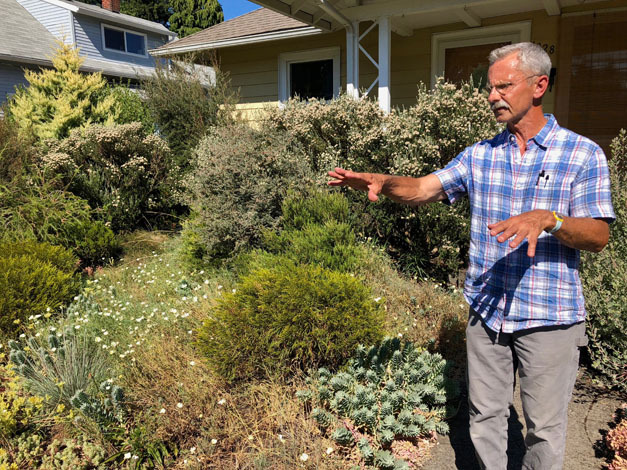 The home garden of Greg Shepherd, extraordinary plantsman and co-owner of Xera Plants, is a living laboratory and testing grounds for the low water, West Coast native, and climate adapted plants that the nursery is known for. Board member Bob Hyland led a spontaneous board discussion on the merits and seasonal features of Greg’s summer-dry landscape. The garden gets little to no additional water, even in record-breaking heat like what we experienced that weekend. Cynara baetica var. & morrocana and Melianthus major—a brilliant plant pairing in Greg Shepherd’s garden. With PHS travel concierge and board member Linda McKendry looking on, fellow board member Bob Hyland said it best: our Pac Hort community is strong because of YOU! 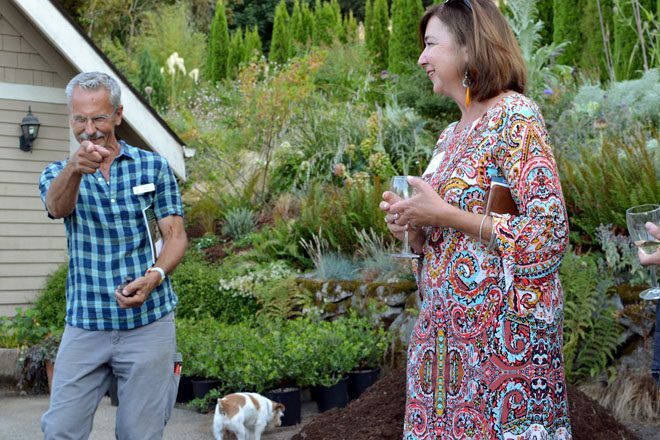 Our weekend concluded with an evening-in-the-garden gathering with local PHS members and colleagues, hosted by Bob Hyland and his partner, Andrew Beckman, (both at right) in their glorious plant-filled garden.